Last Friday, for the second time in my life, I had the pleasure of trying bread pudding. We were having the usual free Friday lunch at my workplace, and the dessert options are usually fruit or cookies. Well last week the cafeteria decided to give us bread pudding as a special treat, how nice! I was a bit skeptical at first, because it looked a lot like stuffing… but after my first bite I was completely hooked and my first thought was that I must learn to make my own bread pudding! 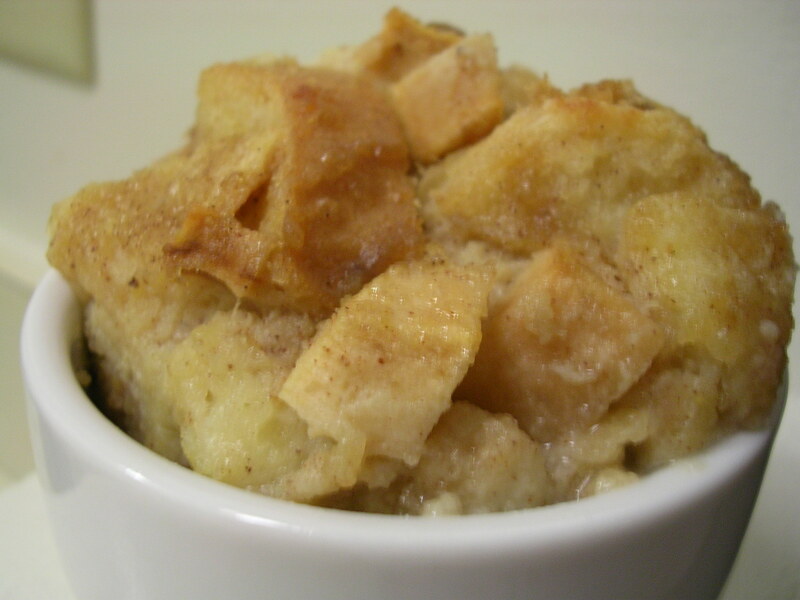 Like no other dessert I've tried before, bread pudding has a mild creamy flavor that simply melts on your tongue, and a unique soft, chewy texture that isn't at all like eating bread. The bread pudding I had that day also had some blueberries baked in, which gave the pudding a wonderful fruity sweetness, since the pudding itself is not too sweet. Just heavenly – my kind of comfort food! So this weekend I finally went grocery shopping and restocked my fridge (which is why there haven't been any updates this past week… I didn't feel like making more eggless and butterless baked goods). Being a frugal student, I always check the clearance racks at the supermarket, just in case there's anything useful to me. This time I saw a huge loaf of sliced Italian bread on sale for just $1, because its sold-by date was that same day. Well no problem, I could just freeze the loaf and keep it for however long I want – what a steal! I wasn't actually thinking of the bread pudding when I bought the bread, but today the thought came to me and I was simply giddy with the idea that I had the perfect bread for bread pudding. The one thing I didn't have was berries or raisins, which are usually added to bread puddings, so I just used an apple instead. 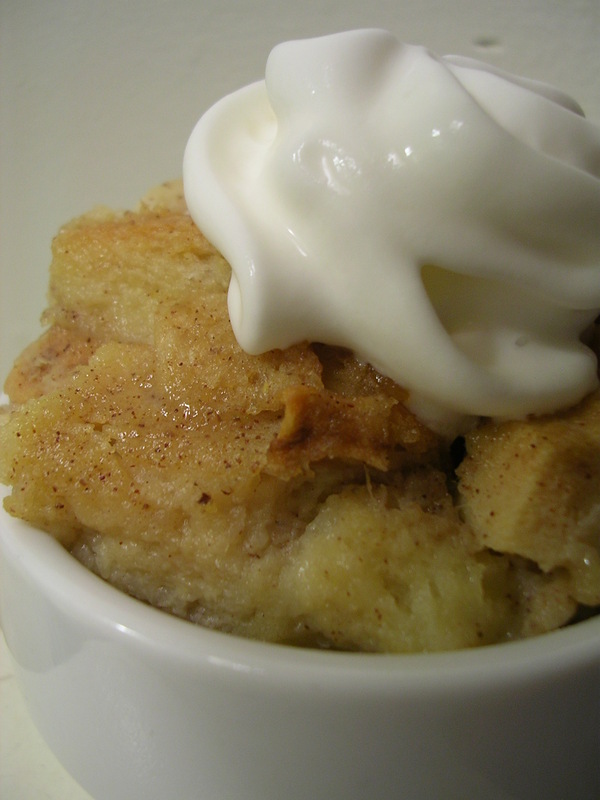 And it being St. Patty's Day weekend, I knew it was the perfect occasion to pull out that Bailey's Irish cream and add a little zing to my bread pudding. The stage was set! 1. Preheat oven to 375 degrees F. Grease a 9" diameter round pan, or equivalent square baking pan. 2. Cut bread slices into cubes (don't remove crust). 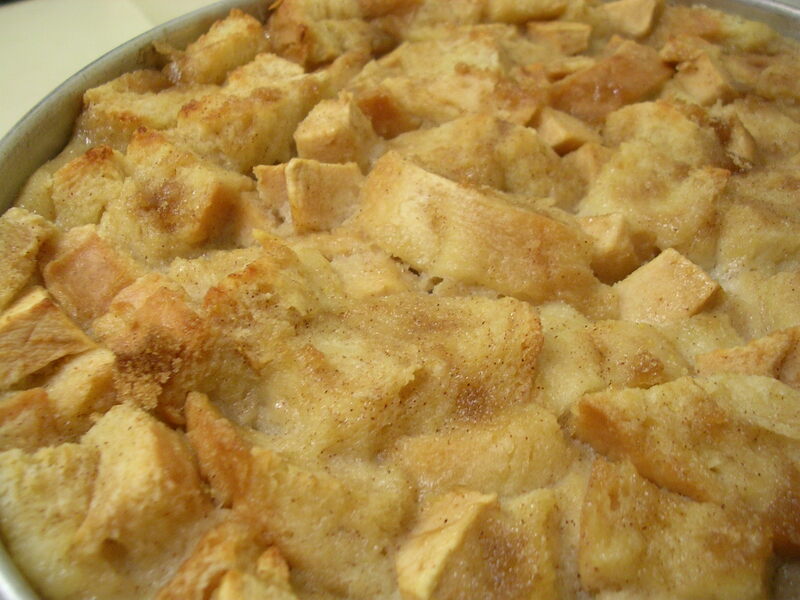 Toss in melted butter, then mix in diced apples. Lay into baking pan. 3. Scald the milk by heating over medium heat until just starting to bubble at the edges (do not let boil!). Remove from heat immediately. 4. Beat together eggs, applesauce, sugar, vanilla and almond extracts, and salt. Slowly stir in milk. Add Bailey's Irish cream and mix well. 5. Slowly ladle the milk mixture over the bread cubes in the baking pan, making sure to coat all the bread. The liquid should come up to just short of the rim of the pan. Let bread soak in milk mixture for 10 minutes. 6. Sprinkle brown sugar over top and bake for 30 minutes, or until bread bounces back and liquid does not ooze out when pushed with a spoon. Serve warm or cooled, with whipped cream or ice cream if desired. Having tried the bread pudding both hot out of the oven and later when it had cooled off, I would say that I think I like the texture of the cooled pudding better. That's obviously a personal thing, since I like my bread pudding a bit chewier, whereas others might like it more soupy or soggy. The hot bread pudding certainly has more liquid in it, so it has more of a melt in your mouth, custard-like texture, which my boyfriend really liked. I thought the apples in the pudding were great – they complemented the cinnamon in the pudding, and added a nice little bit of soft crunch and sweetness. This entry was posted on Monday, March 17th, 2008 at 6:30 am	and posted in baking, desserts, fruit and nuts, healthy, recipes, Uncategorized. You can follow any responses to this entry through the RSS 2.0 feed.